It looks a little like the low-res rendering of an urban center, complete with soaring skyscrapers and densely-spaced low-level buildings. But this picture depicts something altogether more fascinating: the SMS (short message service, or text message) traffic traveling through the air of Amsterdam at one specific time. Specifically, the unique images show SMS traffic on a recent New Year’s Eve, with the peak traffic predictably taking place right around midnight. The visualized text messages are arranged by the places from which they are sent, creating wonderfully architectural shapes that look much like an actual city center rendered in digital detail. 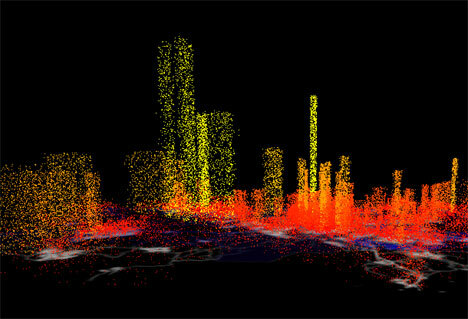 The project was created by Aaron Koblin, an artist who specializes in data visualization. See more in Digital Design or under Technology. December, 2010.